So now someone has gone and published a new titanosaur that would fit in the part of the alphabet we've already covered. We'll just have to kind of wedge it in, if you can buy the idea of wedging a titanosaur into anything. When the news that a dinosaur named Baalsaurus had been published broke Monday on the Dinosaur Mailing List (thanks to Ben Creisler for keeping us all up to date! ), I immediately wondered what the connection was with Baal, the Phoenician fertility god moonlighting as an Abrahamic heavy. (Spoiler: it's secondhand—"Baal" is the name of the locality.) I wasn't expecting a medium-sized, square-jawed, seemingly inoffensive South American titanosaur. Still, it works in a certain theological sense. Looking at it from a Phoenician point of view, titanosaurs clearly were doing something right with regard to fertility, so it's entirely appropriate for Baalsaurus to be a titanosaur. From the demonic usage of Baal, if you were thinking Baalsaurus would be something a bit more "heavy metal album cover", sure, you'd be disappointed. On the other hand, if you accept the proposition that forces of evil and suffering in the world are generally much more mundane than supernatural humanoids, a titanosaur is more fitting than a slavering theropod. Genus and species: The "Baal" in Baalsaurus does not refer to any particular characteristic of the dinosaur, but to the name of the locality, the Baal site, which itself is named after Baal. (I wonder what the story is behind the site name.) 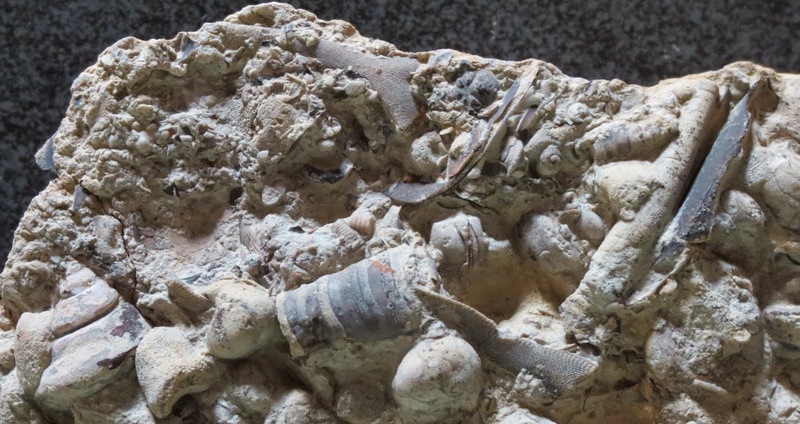 The species name "mansillai" honors the discoverer of the fossil, Juan Eduardo Mansilla, a technician at the Geology and Paleontology Museum of the National University of Comahue, Parque Natural Geo-Paleontológico Proyecto Dino, Barreales Lake (Calvo and Gonzalez Riga 2018). Citation: Calvo, J. O., and B. Gonzalez Riga. 2018 [epub ahead of print, so I suppose it'll be 2019 by the time it's official, but we'll just call it "2018" here for simplicity]. Baalsaurus mansillai gen. et sp. nov. a new titanosaurian sauropod (Late Cretaceous) from Neuquén, Patagonia, Argentina. Anais da Academia Brasileira de Ciências (advance online publication). doi:10.1590/0001-3765201820180661. Stratigraphy and geography: Upper Cretaceous Portezuelo Formation, the upper part per Figure 2, so Coniacian in age; Baal locality on the north shore of Barreales Lake, near Añelo in eastern Neuquén Province, Argentina (Calvo and Gonzalez Riga 2018). Holotype: MUCPv-1460 (University of Comahue Museum Paleovertebrates, Geo-Paleontólogical Natural Park Proyecto Dino), a nearly complete right dentary. 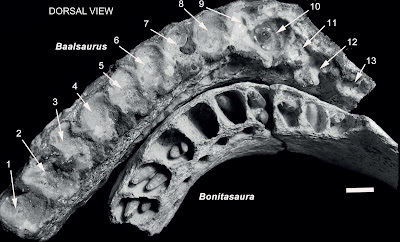 Figure 3 from Calvo and Gonzalez Riga (2018), showing the holotype dentary of Baalsaurus with the dentary of Bonitasaura. The 13 tooth positions of the Baalsaurus dentary are indicated. The scale bar is 1 cm. Both dentaries are oriented with what would have been the leading edge of the jaw facing the upper left corner. CC BY 4.0. Now that we've had our first theological discussion on this blog, we can get down to the nuts and bolts of B. mansillai. With only a dentary, there's not a lot to worry about. As mentioned, it's of the square-jawed variety, putting it in the company of Antarctosaurus wichmannianus, Bonitasaura salgadoi, and Brasilotitan nemophagus. Most of the teeth are in the squared-off front of the dentary ("anterior ramus"), with ten tooth positions there and only three known on the lateral part of the dentary ("posterior ramus"). These three teeth of the posterior ramus are smaller than the other ten, with the largest tooth position being the one on the corner where the rami meet. At least three teeth can be in each tooth position, one in use and two more in the jaw to replace it. The teeth are of the "pencil-like" variety. The dentary is not preserved beyond the third position of the posterior ramus. The jaw is deep at the "chin", which is sloped such that the lower part of the chin sticks out a bit (Calvo and Gonzalez Riga 2018). In other words, Baalsaurus mansillai had a strong jawline. Calvo and Gonzalez Riga (2018) distinguish three types of titanosaurian jaws. The first, "U" shaped, is the most common and features dentaries that make a rounded connection when viewed from above or below, with teeth present from the joint to a position much farther back in the jaw than the other two types. This is more or less your basic dinosaur jaw. The second, "L" shaped, accounts for B. mansillai, Antarctosaurus, and Brasilotitan. In these titanosaurs the dentaries have a straight connection, giving the jaw a rectangular appearance from above or below, and the teeth are packed into the anterior ramus. This configuration is kind of like a nail clipper, if your nail clipper was equipped with skinny pointed teeth on its cutting edges. Finally, Bonitasaura is described as an intermediated third "smoothly curved" shape. No phylogenetic analysis is provided, although it would certainly be interesting to see if a clade of square-jawed titanosaurs shows up, or if this is an adaptation that appeared more than once. Similarly, there's not a whole lot that can be said about the size and shape of Baalsaurus, although the preserved part of the dentary is somewhat larger and more robust than that of Bonitasaura (not that it's difficult for a titanosaur to be larger than the holotype individual of Bonitasaura), and the authors propose that the skull would have been on the order of 40 cm long (16 in). For reference, this would be somewhat smaller than the skull of the type individual of Nemegtosaurus mongoliensis, which I base on the rigorous approach of eyeballing the figures in Wilson (2005). A recently recovered femur from that individual is 124 cm long (48.8 in) (Currie et al. 2018).